My friend invited me to his church’s Carol of 9 lessons last Christmas. Although the 9readings bore me, I enjoyed all the Christmas melodies the choir sang. One thing piqued my interest during the service, one of the readers, the 8th in particular -a rich woman, after reading the verses from her Bible on a lectern, announced to the congregation. “From my own purse, I donate the sum of N100,000 to the choir” She said. This isn’t a new scene in church nowadays. The church has lost her way, people go to churches these days to show off their affluence and opulence. What happened to giving in secret? It is written in the Bible, if you give to God for people to praise you, don’t expect any gift from God because you have been praised and exalted on earth. The fact that pastors and Bishops allow this act to go on in the church baffles me. I mean, they have great knowledge of the WORD and know it is wrong in all ramifications. The church is the only place where the poor and the rich are supposed to be equal even if it is for 30minutes but the case is different nowadays, pastors recognise the presence of “top shots” during mass. What is that????? Pastors are supposed to be the voice of people and the bridge between the Government and the people but now they lick the asses of those in power in order to get a substantial donation from them. They can’t even stand on the pulpit and tell them their sins to their faces anymore rather when they climb up there, they lie and brain-wash their congregation with “prosperity messages”. Some pastors own private jets, off from the donations and offerings of their poor congregation and they claim the jets are for evangelical work. I pray oh!!!! In the past, the church clothed, fed and trained children from poor backgrounds in schools. Today, there are so many religious affiliated secondary and tertiary schools which the poor ones/members can’t even afford to send their kids to. The church has become a money-making venture. We have more motivational speakers than pastors these days. All you need to be is a good orator(good command of the lingua franca/good with words) and have an in-depth knowledge of the Bible and you are ready to start off your own ministry. The other day, I met a man of God and he said to me..”God told me to tell you, you are destined for greatness but people are after you. I’m going to pray for you and after that, ‘anything’ you feel is good, you donate to my ministry.” Emphasis on anything. A lot of pastors go around scamming people all in the name of God. Our insatiable thirst for miracles has made us easy preys for these ‘predators’. Some christians go from church to church in search of miracles, signs and wonders. During sermon, some pastors will tell you how they prayed for one sister/brother and his/her life turned around for good and I often ask, isn’t that blowing your own horn? Is it necessary? As we celebrate this easter period, let’s have a sober reflection of what Jesus Christ did for us on the cross of Calvary, how he suffered death and was buried so that we may have life. Christ is the reason for the season,let us celebrate his death and resurrection and most importantly, live a Christ-like life. May God help us all. Amen. Whenever I listen to Shaggy’s Church Heathen track, I can’t help but nod my head in agreement as I believe the singer portrayed everything that is wrong with the church today. Have you noticed how we deviate from our evil ways when we are troubled and in dire need of God’s intervention in our lives? Yes, that’s what conditional/partial repentance is all about. Partial repentance means partial escape from sin. It occurs when a person honestly repents for certain things in his/her life that he/she has done wrong, but not for everything. He/she doesn’t see it all. He/she only sees a part of the sin, so he/she is repentant only for the part he/she sees. 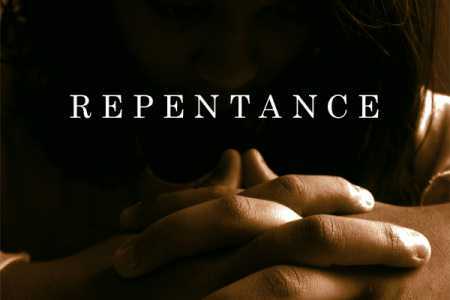 Conditional repentance is when an individual repents conditionally/partially because he or she is asking God a favour. I believe christians are guilty of this, one way or the other. One minute, we are so “spiritual” because we are heavy laden but the moment the loads are taken off our chest by God, we return to our old ways. That’s a common thing amongst us. I believe everybody is/has been a conditional repentant at one stage in his/her life. We run to God in times of trouble and turn our backs on him when HE delivers us from our troubles. Don’t get me wrong, I’m not a saint, I’m just saying it the way it is and I feel it is better we repent completely with a pure heart, not just when we need something from our creator. Repentance is the most noble and beloved form of obedience in the eyes of God. He loves those who repent and it is because of His love for His creation that He tests them with sins so that He may shower His blessings and favours upon them after they repent. Repentance is to repent from the heart,to train the heart into obedience and to make a firm resolution never to commit the sin again. Repentance brings about humility and a sense of helplessness that is not easily acquired through other forms of worship. Let me leave you with this piece of advice,if you take this too seriously, then you really need some church.